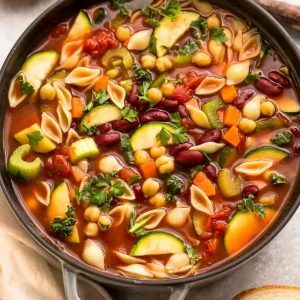 Homemade Minestrone Soup - the perfect easy comforting meal on a chilly day. Best of all, this classic stove-top recipe is hearty & full of fresh vegetables and beans. Add onions, garlic, carrots and celery and saute for about 4 minutes, or until vegetables are slightly softened. Add basil, oregano and thyme and cook for an additional 1 minute. Add the diced tomatoes, tomato paste, bay leaf, vegetable broth and both of the beans. Depending on how large your pot is, add just enough water to cover the vegetables. Bring soup to a boil, then reduce heat and allow to simmer for 20-25 minutes. Stir in the dried pasta shells and zucchini and cook for another 10 minutes, or until pasta is cooked. Stir in the spinach and allow to wilt (about 1-2 minutes). Add more water as needed if you like a thinner soup. Season with more salt and pepper as needed and stir in balsamic vinegar (if using). Serve warm with bread and top with Parmesan cheese and garnish with parsley if desired.